WASHINGTON — Voters chose Rep. Chris Van Hollen to serve as Maryland’s next U.S. Senator over Republican Kathy Szeliga on Tuesday. Van Hollen garnered 60 percent of the votes to Szeliga’s 36.5 percent. Green Party candidate Margaret Flowers earned 3 percent, according to unofficial election results. Van Hollen, a Democrat, will succeed retiring Sen. Barbara Mikulski, who has represented the state in Congress since the 1970s. He won with Mikulski’s endorsement. She is the longest-serving woman in the history of Congress. “I want to thank you for making me your partner in change in the United States Senate and together we know we have a lot of work to do,” Van Hollen told supporters gathered in Silver Spring. “Let’s be dreamers and doers together. 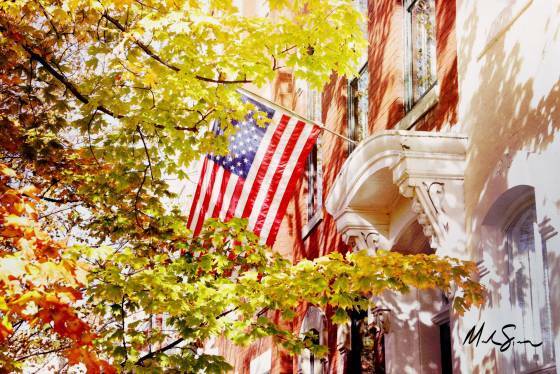 Let’s get to work Maryland, let’s get to work America,” he roared. He was joined by fellow Democrats Jamie Raskin and Anthony Brown — all of whom also won their respective House races — along with many of the state’s other members of Congress and other state and local elected officials. Despite the groundswell of support for Republicans in other states and the popularity of Gov. Larry Hogan, Marylanders stuck with Democrats on Tuesday and the composition of the state’s congressional delegation remains unchanged with the exception that no women will be among them. Szeliga is a state delegate from Perry Hall in Baltimore County. And even with support from Hogan, she faced an uphill battle in a state where Democrats outnumber Republicans 2 to 1. She will continue to serve as the Minority Whip in the House of Delegates. “The people of Maryland know that we wanted change. And I haven’t forgotten that. There is a movement for change. I’m going to continue to fight for you,” Szeliga said. “This was never about me. This was about you, it was about us, it was about Maryland,” she said. Van Hollen has represented the 8th District, which includes parts of Montgomery, Frederick and Carroll counties, since 2002. Long lines in Baltimore when the polls closed at 8 p.m., forcing the state to delay the release of results. Some scattered voting problems were reported in Maryland during the day. Raskin, a state senator from Montgomery County, will fill Van Hollen’s 8th District seat representing Montgomery and Carroll counties and most of Frederick County. The Democrat faced Republican Dan Cox, a lawyer from Frederick County, Libertarian Jasen Wunder and Green Party candidate Nancy Wallace. He won 59 percent of the votes, according to unofficial election results. Former Lt. Gov. 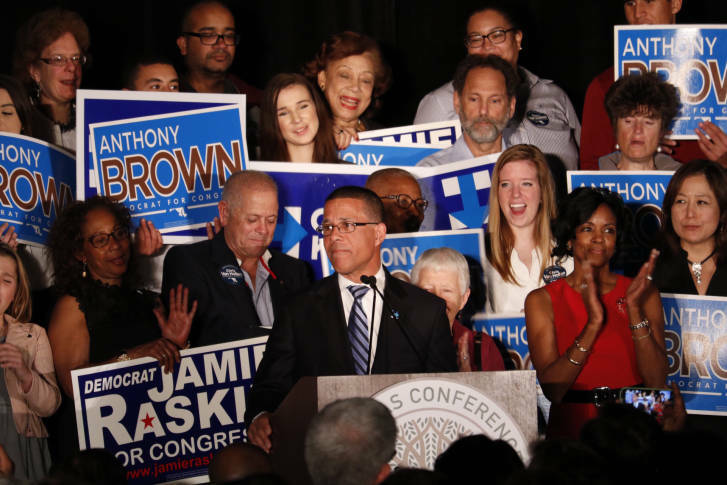 Anthony Brown will represent the state’s 4th Congressional District with a win over Republican George McDermott, a small-business man who has run for Congress multiple times, and two other candidates. He garnered 74 percent of the votes, according to unofficial election results. “It’s great to be back,” Brown said to cheers from supporters. The win cements his political comeback after a stinging loss to Hogan in the 2014 gubernatorial race. He’ll succeed Rep. Donna Edwards who opted to run for the state’s open Senate seat but lost a competitive primary race to Van Hollen. Rep. John Delaney fended off a challenge from Republican Amie Hoeber to secure a third term representing Maryland’s 6th District. The Potomac Democrat garnered 55 percent of the vote, according to unofficial election results. Maryland voters approved a constitutional amendment to update the procedures to fill vacancies for the elected positions of state attorney general and comptroller. In Prince George’s County, voters agreed to expand the County Council and give current serving council members the chance to run for the two proposed at-large seats, exempting them from term limits. Voters also supported borrowing money to cover the county’s portion of the Purple Line. The Associated Press and WTOP’s Kate Ryan contributed to this report. Ryan reported from Silver Spring, Maryland.